A couple of months ago I blogged about my 5 tips to lose weight naturally and love your body. These tips are what have worked for me for the past four years and allowed me to lose weight and keep it off. I wanted to dive into each step a little deeper in order to give you a guide that might help you lose weight for good and love your body just the way it is. Number 1 on that list is the Food Mood Journal. A food mood journal is a journal that tracks what you eat and how it makes you feel. Very simple. It’s not a calorie counter or fitness program to make you feel guilty about your eating. The journal is all about creating awareness and realizing patterns in your life. Once you truly become aware amazing things happen. Awareness of what you eat, drink, to how you act is huge. I believe from awareness all things are possible. Calorie counting apps and diet trackers never worked for me. Instead they were another diet scheme making me feel crazy when I went over the so called 1200 calories I allowed myself for the day. I don’t track calories or fat in my food mood journal. I couldn’t even begin to tell you how much fat is in my morning cereal or pasta dinner. I go solely on eating when I’m hungry, stopping when I’m satisfied, and noticing how food makes me feel? Those are the only things you need to remember when starting a food mood journal, what did you eat, how did it taste, and how do you feel 20 minutes later, one hour later, or the next day? Woke up at 4:30am – Feeling tired but not hungry. I had coffee, black, no cream or sugar. Several cups of water, ready to start Sarah, Ty, and Mel. 7am – Breakfast – high fiber cereal, fruit, almond milk. Feel great. Not too full and the cereal and fruit taste delicious. 12pm – Starving. Probably waited too long to eat my next meal. I’m feeling low energy, grumpy, and hungry. I have a hard boiled egg, half a wheat pita, big scoop of guacamole, about 8 tortilla chips, piece of fruit. Again, I feel good after eating this. Not too full but I did eat way too fast. 6pm – Dinner. Crab linguine with side salad. Tastes great. Glass of red wine, dessert is 4 or 5 cubes of dark chocolate, definitely full. Going to give myself a couple hours to digest the food and then bed. This is an example of my food mood journal. It’s what works for me. It might not work for you. You might need more or less food, you might need to eat more frequently or at different times. That’s ok. It’s becoming aware of what you eat, how does that make your body feel, and if it doesn’t make your body feel good what needs to change? Food should make you feel energized and light…ALWAYS. Food should never make you feel tired, depressed, bloated, gassy, or sick to your stomach. This was really hard for me to learn because when I was on a diet I was always thinking about the food and never actually thinking about how the food fueled me or tasted. Keep the journal for about two weeks before you even reflect on it. The journal should be a fun learning tool. You want to just relax and get a good snap shot of how you’re eating on a regular basis before you evaluate if you want to make changes. I will be honest losing weight through the food mood journal is just one step in the bigger mindful eating picture and everyone gets it at different paces. After dieting for 15 yrs it took about two years working with my food mood journal to find the right balance and combinations of foods that didn’t make me tired, depressed, bloated, and sick. Give yourself a lot of time. After you’ve kept your journal for a couple weeks go back and look at patterns. When do you find yourself tired, in a food coma, or binge eating? Is it at night or is it when you go too long between meals? Boom…that’s where change happens. How does that make you feel when you over eat at lunch? Probably not great. So the following week try changing it up. If you’re tired after eating a big carb filled lunch have half the lunch instead and add a piece of fruit or veggies. This isn’t about taking anything away it’s about finding the RIGHT food combination and amount to keep you energized and healthy. Lastly and this is the biggest factor to a successful food mood journal…NO JUDGMENT. It can be really hard to not hate our bodies and dwell on how we should be eating, but that’s the key when you’re learning awareness and just beginning to have your body guide you as to what to eat. You have to trust yourself again. Trust that the food mood journal will help guide you to eat when you’re hungry, stop when you’re full, and make good food choices. 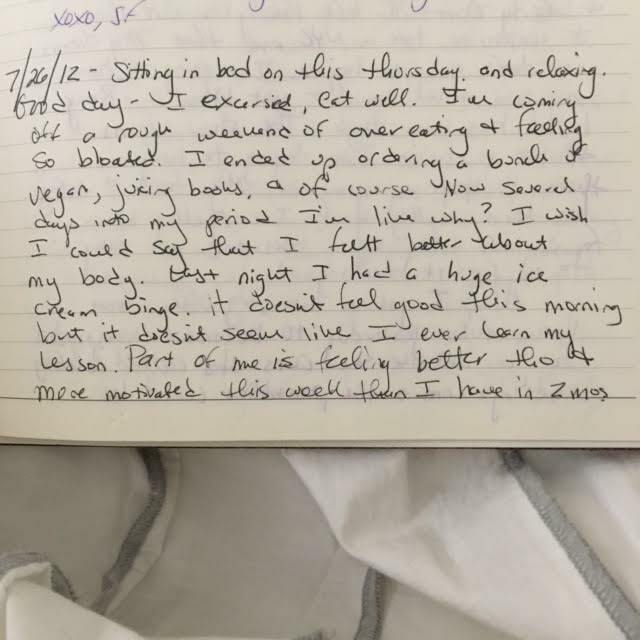 PS – Here is an entry from my food mood journal several years ago. A little all over the place but helped me see a pattern. Posted on August 20, 2015 in General. I am a huge fan of the show and was a huge fan you, Mel, and Sammy on the other show as well. You guys are great. I have struggled all my life with weight issues. This def. seems like a better alternative, however, my issue is motivation. I get motivated for a few weeks, then lose it. I eat when I am stressed. I have two kids, so it is hard for me to make time to exercise. That is what I tell myself anyway. I tried clean eating for a few weeks, and I did feel better when I was doing it. I have to have the PSL! Was there anything you "let" yourself have? I know you said you didn’t keep count of calories or fat, but you had to be mindful of what you were eating since you lost all that weight and look so fantastic. How often do you treat yourself? Is there anything you NEVER cut out because you felt it was not realistic? I run on Dunkin’, for real. The coffee, not the donuts. 🙂 I gained my weight after I had kids. Like 60lbs. Gross right? I know. It is my fault, I did gain while pregnant, but there really isn’t an excuse for keeping it off. I have tried shakes, which I do like, but hard to stick with as well. Natural does seem better, it is just better all around. My brother has a friend who developed an auto immune disease as a result of processed foods. What are some things you eat for lunch?? I tend to do ok at work, then when I go home it is alllll down hill. I need to mix it up a bit with recipes. And try to get my hubby on board with stuff he will eat. Thank you for always keeping it real. I love your honesty.